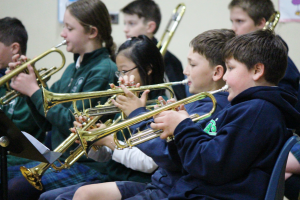 Band is offered to students in grades 4-8 through the Bellarmine Parochial Band Program. The band directors from Bellarmine provide quality instrumental music instruction onsite at each of the county’s participating parochial schools including Saint Patrick Catholic School. Students take band classes at their own schools two to three times each week, and then meet every other week in a county-wide, combined, evening rehearsal on the Bellarmine campus. The full Bellarmine Parochial Band, sponsored by Bellarmine Preparatory School, performs together, giving nearly 200 students the opportunity to perform at seasonal concerts and community events with full instrumentation. Cost: Cost for band will be $45 per month. Schedule: Each school has two bands (Beginning and Advanced) and each band has two 50-minute rehearsals during the school day each week. Twice a month there will be evening rehearsals for the advanced band at Bellarmine. Beginning band will also have some evening rehearsals around concert time. Ms. Bales is the Head Band Director for the Bellarmine Parochial Band. In addition to being the primary teacher for in-school rehearsals, she will lead the evening combined rehearsals at Bellarmine. Mr. Morris is one of two Assistant Band Directors coming on board this year to serve the Bellarmine Parochial Band. He is currently studying music education at PLU. He will be teaching the Advanced Band and Beginning Band at Visitation STEM Academy. Ms. Query is one of two Assistant Band Directors coming on board this year to serve the Bellarmine Parochial Band. She is currently studying music education at PLU. She will be teaching the Beginning Band at Saint Nicholas School. Rent an instrument online at Ted Brown Music. Use promo code PVH. If you have questions about instrument rentals, email Pat Van Haren, representative for Ted Brown Music. If you have questions about band, please contact Ms. Hope Bales.